This noble house is situated in a privileged location in La Orotava and was built in the early eighteenth century. The building was refurbished in 1947 and the floors were modified to Neo-Canarian style. This house belonged to the Noble family Marques de Celada, founded in October 1734. Born in December of 1824, Camilo Benitez de Lugo and Medrada, Lawyer, MP for Tenerife in the Constituent Assembly in 1854 and Knight of the Royal Order Carlos III. The house was restored, reformed and modernized in its entirety in 2002, it is distributed over three floors with two patios and a total of 9 bedrooms, 7 bathrooms, 1 shower and 2 kitchens. In addition to this the property has an office, reception, co-working area, a spacious 80 m2 room, rooftop terrace and a solarium on wood. It has been renovated with quality materials, wooden floors and ceilings, double glazed windows and copper gutters. Everything is integrated harmoniously respecting the elements and noble and harmonized structures, creating an excellent atmosphere. A unique space in its beautiful surroundings, tranquillity and elegance. This is a commercial property for sale in Barranco Las Torres Adeje Spain. Adeje is a municipality in the southwest of Tenerife. The size of the property is 394 square metres and the current owner has owned the property for ten years. The property is in a great location just off the main road. The property is divided into two floors. The access floor has 326 square metres and there is also a top floor that is 68 square metres. The top floor could be used as an office and the main ground floor for a variety of businesses. There is also 98 square metres of private parking. The property is set in a commercial area with other busy businesses that would bring trade and customers to the area. There is a local supermarket, a local fruit and vegetable store, a couple of petrol stations and electronics store. The price on the property is negotiable and open to offers. This area is extremely popular with tourists. The sandy beaches close by are very well maintained and there are a lot of high-class hotels and entertainment in the area. There are a lot of outdoor activities in this area such as jet skiing, wind-surfing or maybe you would like to go whale watching or watch some dolphins in their natural environment. There are two fantastic water parks in this area. So, the commercial property is seen as a great investment in an area that is extremely popular and is likely to see prices go up over the next few years. The international airport is only 24km away and Gold Costa Adeje is a ten minute drive so everything is on your doorstep. Country Hotel in Los Menores Country Hotel - Reduced to sell! We are pleased to offer for sale this special 10 + Bedroom Hotel, with bar area and restaurant with a separate cabaret / entertainment room and extensive tropical gardens The property consisting of: Reception Area, Bar, Restaurant, Breakfast Room, Terrace, Guest Rooms, Staff Apartments, Letting Rooms, Conference Room and Penthouse Suite. Extensive Tropical Gardens, Swimming Pool with surrounding Terrace, Roof Terrace with views to the Ocean and Mountains. Parking Area. The development has vast scope and potential but has been standing empty, so investment is needed, which is reflected in the asking price. With investment this wonderful property could be re-opened as a Hotel, Bed and Breakfast or Retirement Home. This property is situated just a 5 to 10 minutes drive to the beach and yet nestled in a quiet rural setting with a swimming pool and gardens. Business Broker Associate Tenerife Download our Prospectus Territory: Tenerife - Reduced to €35,000! Business Broker Spain are Spain’s leading business sales specialists. Business Broker Spain is looking for regional associates in Spain and Portugal. Read on for more information about the Business Broker Spain Associate Opportunity... What Does Business Broker Spain do? If you're looking to sell your business, you'll want to talk to Business Broker Spain. Business Broker Spain understands the needs of both business owners and prospective buyers, and makes sure the period of transition goes over smoothly. With success under our belt, we have a network that will provide our clients with unrivalled market exposure and sell. Now for the first time in the company’s history we are launching a network of associate partner offices throughout Spain. What's So Special About The Business Broker Spain Assocaite Opportunity • Marketing: Our comprehensive targeted marketing programme includes exposure in newspaper and specialist magazines. • Experienced Staff: With a rigorous staff selection process, the best possible personnel are employed. • Waiting Buyers: We currently have over 100,000 prospective purchasers in our database, with ready cash funds. • Confidentiality and Discretion: Our Clients can expect complete confidentiality, whether it's advertising or talking to registered Buyers. • Technology: Our state of the art computer networks, along with digital cameras, printers and ISDN driven phone systems help us do our job. • Web Presence: Our websites provides access to our clients as well as serving to advertise our company. • Finance: We have established valuable relationships with many Banks, Building Societies, Finance Houses and other specialist lending sources so that Sellers and Buyers alike can discover sources of capital. • Share In Our Success By Joining the Business Broker Spain Parnership Business Broker Spain is looking for some suitably experienced entrepreneurs to become a Regional Associate in Spain and Portugal. If you fit that description, please contact us. With all administration handled at Business Broker Spain head office, your job will be to source new businesses to sell. You will be provided with first class training, and will be supported locally while you concentrate on generating revenue through Sales and Listings. This world class team wants you to join in running a multi million Euro Business - the future is in your hands! Pizzeria Restaurant in Los Cristianos. Restaurant pizzeria in Los Cristianos, is transferred! with outdoor terrace and views of the sea and port of Los Cristianos, very close to walks, shops and all kinds of shops, restaurants, bars, cafes, with a large walking area for visitors on foot (tourists as well as residential the area and proximities), in addition to a myriad of services in the area for all your efforts and make life easier. Central and commercial at the same time. What more could you want. It works all year. Good weather and good atmosphere all in one! Monthly rent: € 1,500 / m. includes 19% (IRPF account withholding), apart from 7% igic. It is fully equipped, inside and outside on the terrace ready to start working and generate income. He was open for a long time with an Italian audience. Inform yourself without obligation visiting us in our offices. Take your previous appointment with the agent in charge of this recruitment to obtain all the information firsthand with extensive experience in restoration. 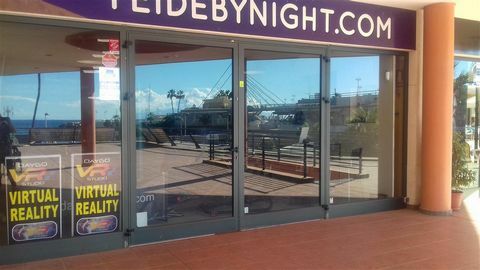 Commercial Property For Sale in Playa De Las Americas, Tenerife. Commercial Property For Sale in San Eugenio, Tenerife. Commercial Property For Sale in Llano del Camello, Tenerife. Bar Cafeteria, completely renovated in Las Veronicas area, Playa de Las Américas, Arona. Cafeteria bar, is transferred! completely renovated with opening license of the City of Arona. Located opposite the Hotel Gala. 220 m2 interior and 45 m2 terrace. Rent € 2000 and Cdad: € 400 per month. Includes 2 parking spaces. Area par excellence where the Bussines prevails, zone of glasses, leisure and music every day of the year. For tourists, for locals, fun at all hours. Come and let us know about this investment and others that we have for you. Call us for your prior appointment with the specialized area commercial. Multipurpose Commercial In San Blas (C.C.). Parking Space In Puerto Colón. An excellent opportunity to purchase a secure parking space in the Centro Commercial Terranova just 50 metres from Puerto Colon. With parking becoming ever more difficult in this area this is a great opportunity. With remote controlled access to the parking area. AN excellent investment opportunity to purchase a package of 32 private garage spaces in the centrally located Centro Commercial Terranova, just 50 metres from Puerto Colon in Costa Adeje. With secure remote controlled access this is ideal for a Rent a Car business or for investors. Typical return on investment is approx 5-6% per annum. Fantastic opportunity. Small shopping center in the center of Las Americas close to Magma and beaches. Second floor 1.200 m2 penthouse suitable for restaurant/disco/gambling or any other activity. Access by a staircase or a lift. Terrace, kitchen, lift and storage rooms. Excellent commercial space in the exclusive Oasis shopping center. Consists of a fully legalized mezzanine office, warehouse, etc …. In the commercial area of Las Americas, “The Golden Mile”, very good business opportunity with high yields 7/8% annual.